55 episodes of Another Path since the first episode, which aired on May 10th, 2017. The Aegis Three take some time for themselves and go on an introspective, psychedelic adventure*. We are happy to announce that we are now on Patreon! 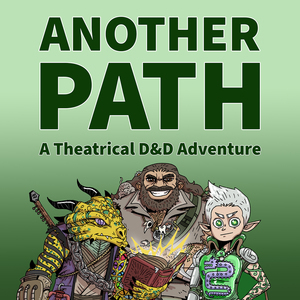 If you like the show and want to help us grow, you can give us a monetary hug over at www.patreon.com/anotherpath! *: Another Path does not condone the use of hallucinogenic Insects, or any other illegal drugs, #seriously #coverdembases. The boys take some time to collect themselves and move forward, only for things to go immediately off the chain. This is helped by this being our first in-person episode, where we all (seriously, for the first time since this show started) had the day off and were in the same city. The audio quality is a little different, but it's still 100% listenable and 100% fun. Want to catch up on Another Path? Jump feet first into our continuing adventures? Brush up on the story so far? This is the episode for you! Join Mordecai as he writes to his mother, Archrduid Leah about everything that's happened since he left home! Mordecai, Zafiir, and Jackson make the final push to save Plainswatch. There is a beast to be slain, a choice to make and a price to be paid. Zafiir reads a book, Mordecai writes in his journal, Jackson writes a letter, and all three make their final approach on the heart of Plainswatch. The Aegis Three start to piece together the Plainswatch mystery, and make a new friend. The Ageis Three push deeper into the city of Plainswatch, and find something/someone/someones unsettling along the way. Zafiir, Mordecai, and Jackson take a day in the city of Norwalk to prepare for the next leg of their journey. The Aegis Three (and Addie) attack the strange man in the headmaster's office and descend far below the Guiteworth Academy. The Ageis Three head north to Norwalk and meet a new friend. The Aegis seeks The Deep, and runs security for fun and profit (or, more realistically, for a good cover). Zafiir, Jackson & Mordecai prepare to go west and do what they can to keep themselves entertained on the journey out. The Wanderer, one of the warlock patrons of magic, is under attack. Can our heroes defend it?